» Forum » Tech » Tech: Modern games » Williams (TAF) testing BR2 AC voltage? » Williams (TAF) testing BR2 AC voltage? Williams (TAF) testing BR2 AC voltage? J101-1 and J101-2 show 9V AC. DC testing on BR2 (following http://www.pinwiki.com/wiki/index.php?title=Williams_WPC#The_.22Replace_BR2_and_C5_Mantra.22) shows 11.3v which I believe is an issue. I recently replaced BR2 and BR3 as I was getting random resets in the game and this was the what a local tech suggested. The tech suggested I also test AC voltage on the BR2 but I've tried a few combinations of testing and get crazy readings (as if it is DC voltage) on the AC test. Do I need to do this or is the wrong DC voltage testing an indication enough of an issue? The tech suggested that the LM323K is probably the issue but I wanted to see if there was some confirmation. I already bench tested the BRs and got valid enough readings on all of them. I did not test the large capacitors as I wasn't sure exactly how to test those. Is LED 4 on solidly? What about LED 6 and LED 1? Do any of these blink or dim with the reset? Can you help me out with the 'anode' side? I know the term and I know, for example, BR2 has +/-/~ designations on the board but I'm not sure exactly where to test. Going to look right now. Ok, I clipped my leads to the banded side of D38 and D3 and got 8.4v. Am I doing that right? 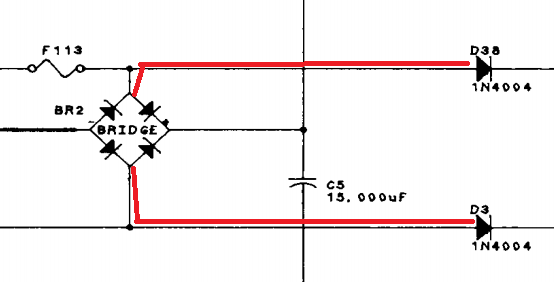 No, the anode side is the non-banded side. Can you help me out with the 'anode' side? An easy way to remember the anode side of a diode. "A" (anode) = the arrow in the diode symbol. No, put your leads on the non banded side. I should have searched Thanks, 50/50 chance! Leave meter on AC, see what is at TP2: negative (-, black) lead on ground, positive (+,red) on TP2. Record your findings, then switch to DC for the same test point, same test lead locations, record your findings there. Ok, I think that is al.. TP5 is ground I believe. Local tech thinks it is the LM323K so I ordered a PSU5 on his recommendation. I replaced the LM323K with the PSU5 and made no difference. Anyone have any further steps I can test? 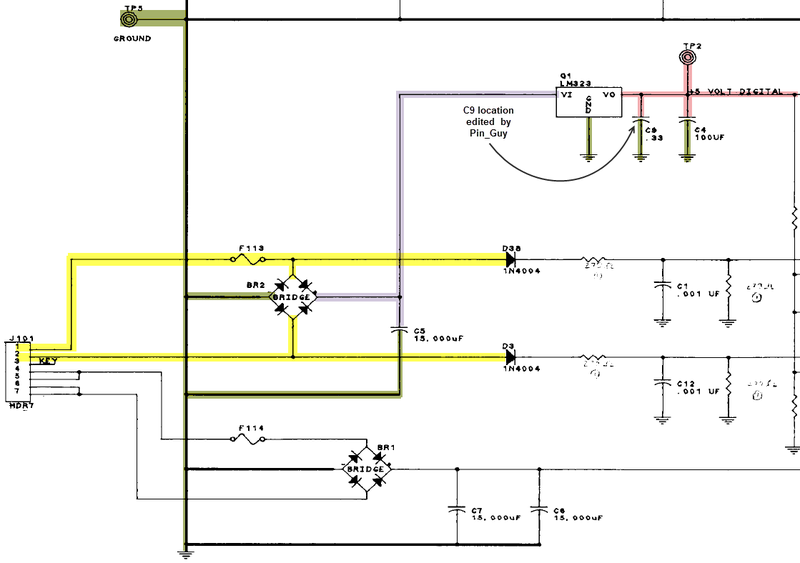 Seems like if I am getting the proper AC and DC voltages out of BR2 and I'm not getting 5VAC at TP2 then C2 would be the next suspect since it is between Q1 and TP2, right? C2? 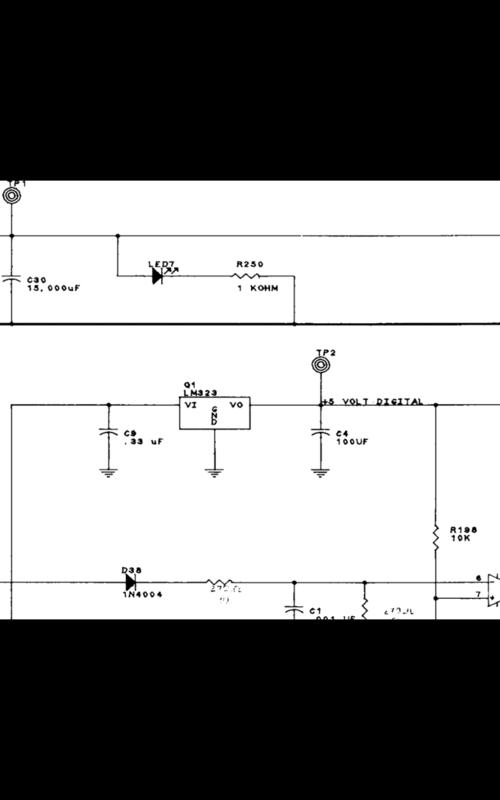 .that's all the way in the other side of the schematic and not related. You do have J114 J116 J117 and J118 disconnected, correct? I guess I meant C4. Why would I have those disconnected? Don't think anyone has mentioned not having those connected. Why would I have those disconnected? If there is a high current draw or a short on the output (J114,116,117 and 118) Q-1, Q-1 will turn off to protect itself. 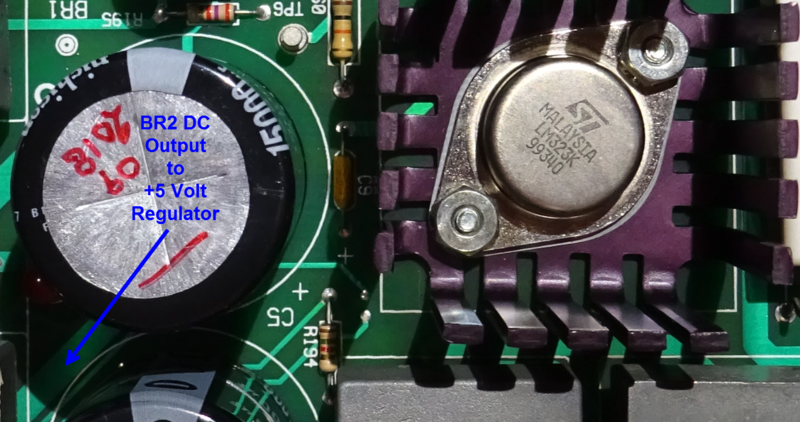 If you disconnect those outputs it will isolate the circuit to just a few components. AH HA... ok, will test! 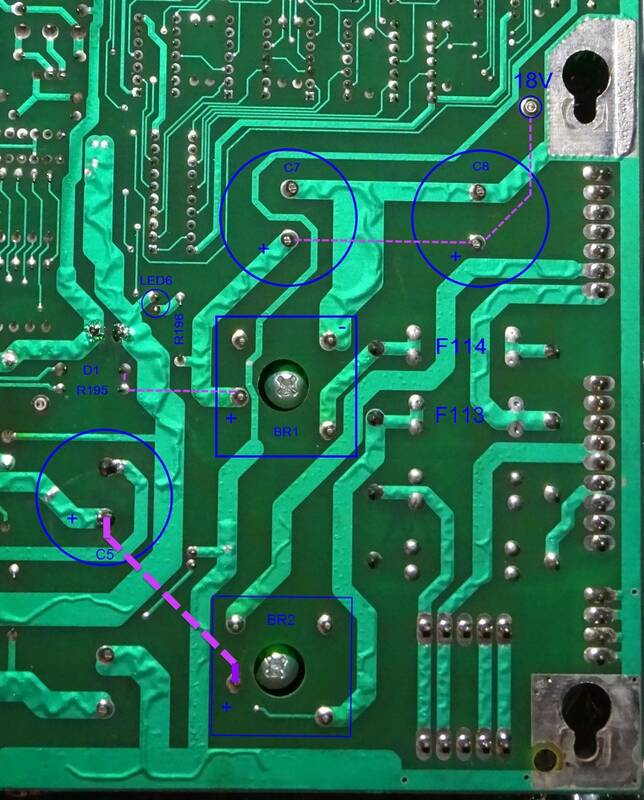 I'm a little surprised no one has asked you look at the input voltage going into the 5 volt regulator, or to ohm out the connection between the bridge output and input to the Q1, as this is an extremely easy check to make when the PDB is out of the machine. If you can make good contact through the solder mask, you can check your voltage regulator input at the point shown below; if you have nothing there, perform an ohms check between the + output of BR2 and the input to the voltage regulator Q1 to make sure you don't have a break in the circuit as there is a transition point under C5 where the DC voltage from the bridge rectifier output on the top side migrates to the bottom side to supply voltage to the LM323K. Edits were made as C9 is NOT on the input side of Q1. Ooh boy... that's a bit past my experience just reading it over once but I'll take it downstairs and look at the board while reading and see if it makes sense. I am still a bit basic in my knowledge of board components, schematic, etc.